A tennis ball machine is an electronic device used to deliver tennis balls to players in the tennis court. The main purpose of the tennis ball machine is to create real life scenarios by delivering balls with different speeds, oscillations, spins etc., and allowing players to perfect their game by handling such balls. Tennis ball machines are increasingly becoming popular among young players and professionals. 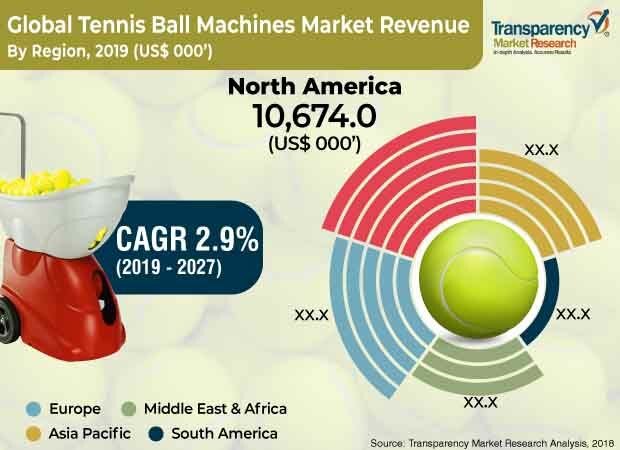 Increasing number of young players worldwide is a major driving factor for the growth of the tennis ball machines market. Earlier, tennis was considered a luxury sport with only a few rich people participating in the sport. However, the trend has changed and many individuals as well as young players are participating in various lawn tennis events. Additionally, increasing number of portable and affordable tennis ball machines is another major factor driving the growth of the tennis ball machines market. Demand for tennis ball machines has grown tremendously with the increase in participation rate for lawn tennis. Tennis ball machines are a perfect fit for amateurs and the machine can continuously throw balls during practice sessions. Some tennis ball machines are also suitable for professional players to make the game more realistic by taking some factors into consideration such as spin, ball oscillations, speed, and direction. Manufacturers are also coming up with technology integrations such as iOS and Android application for the end-user to control the operations of the tennis ball machine. This is also helping in boosting the demand for tennis ball machines. However, availability of fewer manufacturers is one of the restrains for the growth of the tennis ball machines market. However, introduction of tennis as a sport in school curriculums is anticipated to be a growth opportunity to increase the demand for tennis ball machines. Addition of lawn tennis as a sport in school curriculums not only helps in nurturing upcoming talent but also helps in boosting the demand for tennis ball machines. The global tennis ball machines market has been segmented based on type, ball capacity, speed, power, end-user, distribution channel, and region. In terms of type, portable and light weight tennis ball machines are the more favored worldwide. Portable machines are easy to handle and carry and make it the perfect consumer choice. Moreover, light weight machines are a perfect fit for young and amateur tennis players to start from scratch. Tennis ball machines with less than 150 carrying capacity has greater market share. Tennis ball machines with less ball carrying capacity are a perfect fit for young and amateur players. According to speed, machines having speed of 20 mph to 80 mph acquired a greater market share due to the advent of young tennis players. Battery operated tennis ball machines are more convenient due to certain advantages such as low maintenance cost, and portability as well as affordability compared to the electric powered tennis ball machines. Based on end-users, sports clubs extensively use tennis ball machines. These machines being costly are more affordable by sports clubs compared to schools, colleges, and individuals. In terms of distribution channel, offline distribution channel has the major share due to the dominance of licensed distributors across various regions with strong physical presence. Geographically, North America acquired major market share closely followed by Europe. Presence of better infrastructure, government initiatives through funding for tennis sports training across various schools and universities, as well as initiatives of popularizing tennis among the younger generations are key reasons for these regions acquiring greater market share. However, the market in Asia Pacific is anticipated to grow due to the emergence of new players. Some of the key players in the tennis ball machines market includes Ace Attack, Deuce Industries Limited (Silent Partner Tennis), Dongguan SIBOASI Sports Goods Technology Co., LTD, Lobster Sports, Inc., Metaltek (Playmate), Spinfire, Sport Spinshot Sports, Sports Attack, LLC, Sports Tutor Inc., and Staber Industries, Inc. (Match Mate Tennis). Key players operating in the tennis ball machines market adopt numerous strategies to sustain in the market. Product development and acquisition and partnership are some of the main strategies adopted by key players to gain a competitive edge.